As you already know I love to explore. One of my favourite destinations is Jamaica. 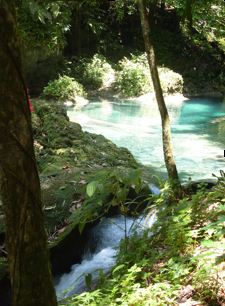 I love the mystic energy of Jamaica and it’s natural beauty. I’m often found lazing on the beach or exploring Jamaicas natural wonders. If you plan on visiting Jamaica and want to experience something a little bit different from the beach (as gorgeous as it is) Reach Falls is the alternative day trip that you will enjoy. Reach Falls lies about a mile below the John Crew river up a steep mountain. Recently opened to the public, the secluded Reach Falls is set deep in the rainforest and nearby banana plantations. Incidentally this is also just one of the many film locations picked for Tom Cruises 80’s movie classic ‘Cocktail’. The following is what I experienced when I visited Reach Falls. A cooling walk through rainforests lead us to well maintained wooden huts where we were welcomed to change into our swimwear. We paid a small fee of 10 USD to experience the natural wonders of Reach Falls. A friendly guide lead our small party up the limestone rock and encouraged us to swim in the most dazzling hue of clear blue mineral water across bottomless pools and natural jacuzzis. Once half way up Reach Falls our party was invited to descend beneath the water, into a underwater cave complete with underwater waterfalls. Perfect timing for a quick rest before the descent down to relax and unwind in the river set below. I highly recommend Reach Falls, Jamaica. See what others have to say.